When your adversaries begin self-destructing, it’s unwise to interrupt them. It’s even more foolish to proactively throw them a lifeline to extricate them from the predicament of their own creation. Apparently, Congressman Matt Gaetz (R – Florida) either forgot that wisdom or never internalized it in the first instance. How else to explain his effort this week to rescue Congressional climate change extremists from the embarrassment of their own "Green New Deal" humiliation last week? By introducing his own so-called "Green Real Deal" this week, Representative Gaetz only provided them a degree of unwarranted validation with what amounts to a "Green Deal Lite." By way of background, we highlighted last week how climate alarmists betrayed their insincerity by abandoning their own Green New Deal legislation, after Senate Majority Leader Mitch McConnell (R – Kentucky) forced them to vote on their own bill. For years, people like freshman Representative Alexandria Ocasio-Cortez (D – New York) have lectured us that our window of opportunity to save the planet from climate catastrophe is closing quickly. Earlier this year, she harangued, "The world is gonna end in twelve years if we don’t address climate change, and your biggest issue is how are we gonna pay for it?" So pretending to match word with deed, Representative Ocasio-Cortez then introduced H.Res.109, her "Green New Deal," on February 7. On the Senate side, Ed Markey (D – Massachusetts) introduced identical legislation, along with co-sponsors that included 2020 presidential candidates Bernie Sanders, Elizabeth Warren, Corey Booker, Kirsten Gillibrand, Kamala Harris and Amy Klobuchar. Both the House and Senate bills demand "a new national, social, industrial, and economic mobilization on a scale not seen since World War II and the New Deal era." Among their laundry list of provisions, each would require "reductions in greenhouse gas emissions from human sources of 40 to 60 percent from 2010 levels by 2030," and "net-zero emissions by 2050." But then Leader McConnell called a Senate vote on the bill that they had introduced. It failed by a 57-0 vote, with its ostensible supporters cowardly voting "present." Apparently, the "climate crisis" wasn’t even pressing enough in their minds to merit Congressional passage. The justifiable mockery came swiftly, with the bills’ apologists angrily rationalizing that McConnell’s simple decision to allow a vote constituted a "stunt." But nobody was buying it. Rather than allow that to hang like a proverbial albatross around climate alarmists’ collective neck and provide an ongoing reminder of their insincerity, along came Representative Gaetz this week. Commandeering the spotlight with what he calls his "Green Real Deal," Gaetz unveiled "a plan to address climate change." "History will judge harshly my Republican colleagues who deny the science of climate change," Gaetz preened. "If we do not reduce global carbon emissions," he continued, "if we merely export the pollution, in service of our own virtue signaling, then we will not have done anything real to protect our beautiful planet." His sense of humility and intellectual equanimity obviously remain intact. The accompanying outline that Gaetz released offers the usual bouillabaisse of soothing but elusive items, such as "robust, economy-wide greenhouse gas emissions reductions" and "more clean energy options through a commitment to innovation." Representative Gaetz appears unaware that the United States has actually led the world in carbon reductions, even after President Trump rightly withdrew us from the Paris climate accord. Specifically, we cut our carbon emissions by over 40 million tons in 2017, while nations like Canada, Spain, Russia and China increased their carbon output. In fact, the European Union collectively increased its carbon emissions by over 40 million tons, approximately the same amount as the U.S. decrease. Someone alert Representatives Gaetz and Ocasio-Cortez that we managed that without either the "Green New Deal" or the "Green Real Deal." For his part, President Trump offered a superior alternative to Gaetz’s proposed plan. Namely, he encouraged Congressional Republicans to allow the "Green New Deal, done by a young bartender, 29 years old" to fester to the detriment of Congressional climate alarmists. That’s certainly better than Gaetz’s proposal to disrupt the U.S. economy, sacrifice jobs and increase government intervention in pursuit of costly and ineffective "green" energy boondoggles. "The urge to save humanity is almost always a false front for the urge to rule," H.L. Mencken once observed. 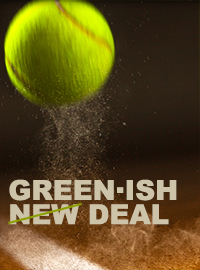 In that regard, Representative Gaetz’s plan merely offers a slightly diluted version of the "Green New Deal." It’s an unforced error, an unwarranted concession to climate alarmists and hopefully meets a quick demise.